Full of beauty and wretchedness, revelations and challenges, African Metropolis is a timely show, launched the week before the EU’s migration summit and following recent Roman unrest and provocation — the brutal closure of a makeshift African migrant camp near Piazza Indipendenza; interior minister Matteo Salvini’s instruction this month to migrants to “ pack your bags”. Many of the shimmeringly vibrant junk aesthetic pieces here operate in zany collusion with the architecture. 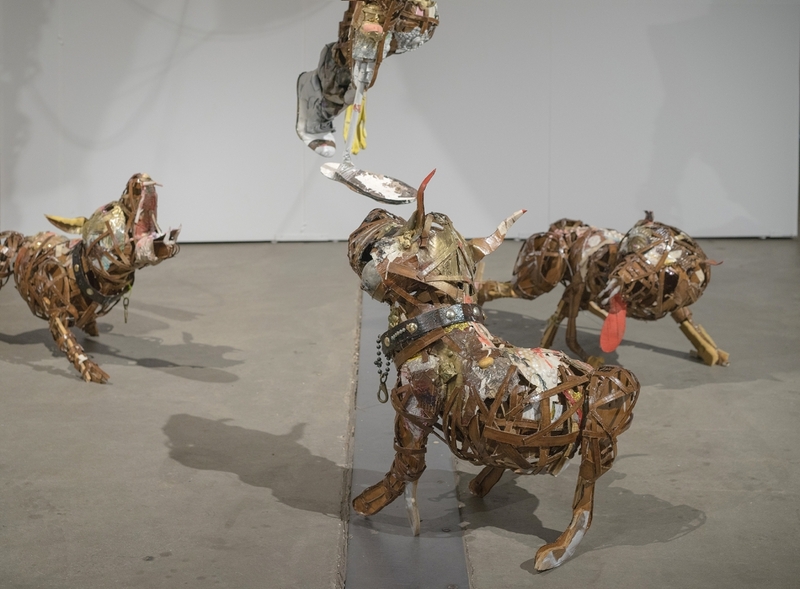 Lavar Munroe’s vicious, outsize, cardboard/fabric/beaded “Gun Dogs”, referencing gang warfare and also political control, snap at your heels as you ascend Hadid’s steel staircase. The rhythmic curves and sumptuous folds of light in El Anatsui’s tumbling aluminium wire and copper map of the earth, “Stressed World”, echo Hadid’s undulating contours.